She leaned over the bed to kiss me. a more pluralistic criticism might put less stock in defending its choices and more in depicting its enjoyment, with all its messiness and private soul tremors — to show what it is like for me to like it, and invite you to compare. “This kind of exchange takes place sometimes on the internet,” he goes on, “and it would be fascinating to have more dialogic criticism: here is my story, what is yours?” It’s in that spirit that I went back to revisit other people’s stories about What Happened to Sophie Wilder. Beha writes his novel from alternating points of view; or, as Sophie herself would say, in alternating styles (“What was style, if not a point of view? A set of values?”). Every other chapter is narrated in first person by Charlie, who remains devoted to the principle of fiction (“[T]he story made the truth irrelevant,” he believes. “The telling was what mattered”). The even-numbered chapters are told in third person, from Sophie’s perspective — the perspective of a devotee to a different principle altogether. The difference in their values culminates in two different endings, two utterly different and incompatible versions of What Happened to Sophie Wilder. Outside the styles and values of his two main characters, Beha gives his readers no assistance in determining what really happened. Fiction is challenged by religion; religion is challenged by fiction; and readers are challenged on the grounds of their deepest values. The two threads–Charlie’s first-person story and Sophie’s third-person story–cannot exist seamlessly. The book is, after all, a story. The question is, who is in charge of that story? Who, indeed, is in charge of life and death? And how does our answer to that question drive the stories we write for ourselves? The final scene, offering an image of redemption in the face of contradictory evidence, achieves an impressive [balance?] between intellectual rigor and unadorned faith. I agree with Greg Walklin in the Journal Star that the novel’s opening is a feint, a kind of sleight-of-hand, setting us up for what seems like a rather clichéd example of the “MFA novel” only to replace it with something more interesting and intellectually ambitious. 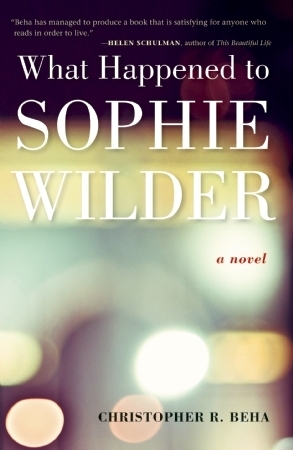 “If “What Happened to Sophie Wilder” was what it appears to be on first glance,” as he says, “– a simple story about a lovesick writer and his mysterious on-again, off-again girlfriend,” it might be hardly worth writing about. “But,” as Walklin says, “there is far more to it than that.” Instead of offering (only) thinly-disguised autobiography and resultingly thin metafiction, Beha sets out to reinvent the conversion narrative for our skeptical age — a move reminiscent of George Eliot’s story of a “latter-day” Saint Theresa in Middlemarch. Walklin goes on, though, to echo Myers’s rapturous evaluation of the novel as “the best fiction I’ve read all year,” and that’s where I part company with both of them, and with the other readers I’ve mentioned. I recognize the book I read in the book they are talking about, and as I said, I didn’t hate it. But I was never enthralled or moved by it, and while I believe my appreciation of it might grow on rereading, I have no desire to go through it again — it just wasn’t interesting enough to me. The writing seemed flat and, at times, forced, and the characters — Sophie especially — seemed insubstantial: concepts more than people. As for what actually happened to Sophie Wilder, well, my conclusion at the end was “not much,” or at least not much that the book made richly present to me. I agree with Sam that the conversion “episode” — on which so much depends — is a particularly “thoughtful, earnest, and unsatisfying passage,” and the crisis Sopohie goes through during her time with her dying father-in-law seemed equally hasty and unmotivated to me: it was not developed in anything like enough detail to thrill me with dread or sorrow at either its problem or its conclusion(s). What did I want from the novel that I didn’t get? Some of the lack I felt is surely a matter of that ineffable thing, taste. Some of my dissatisfaction comes, I think, from the expectations I have developed through years of focusing on particular kinds of fiction — on fiction that offers (to put it simply) more — more to think about, more to work with. For instance, to me the account of Sophie’s religious experience was a reedy echo (at best) of Maggie Tulliver’s struggles with faith in The Mill on the Floss, where her passionate embrace of asceticism after reading Thomas à Kempis emerges from a rich narrative context including overt philosophical reflection on the needs religion meets for those who are suffering inexplicably. By comparison, What Happened to Sophie Wilder is briskly superficial about the social and historical contexts of both Charlie’s and Sophie’s stories. Perhaps that’s because George Eliot thinks religious belief needs explanation, while Beha is emphasizing its spontaneity and inexplicability. Yet I agree with Sam that religious conversion (at least if it’s going to be a central event) is “something that can be expressed in words because it’s real, just as any other experience can be evoked through language. It is hard to grasp, when you read this scene, why Beha would be so quick to concede failure in this respect.” Paradoxically, Eliot’s religion — that is, the religion of her characters — seems more solid than Beha’s, even though the tendency of her fiction is to replace sacred explanations with secular. In doing so, she is of course making a decision about the fundamental split Beha’s dual narration leaves unresolved. Do I perhaps prefer Eliot because of that — because that is my own outlook? Was I impatient — bored, even — by Sophie’s religious struggles because they were left as religious struggles, not absorbed into other ways of thinking about the world? Wondering about this made me think about Silas Marner, which I have come to love, though it is certainly very much about religious faith. Does it satisfy me more because it offers (as Sophie Wilder does) a dual approach, religious and secular (or, sacred and literary) — but only in order to expose the religious as really human, the sacred as really literary? In doing so it conforms better to my own prejudices or preexisting beliefs: was my response to What Happened to Sophie Wilder a tacit form of resistance to Beha’s apparent openness not just to religion in general (or some kind of vaguely embraced spirituality) but to Catholicism in particular? I have been trying to think of another contemporary novel with a genuinely religious protagonist that I did like — and Gilead comes to mind, so I don’t think it’s as simple as my unconsciously rejecting faith as a literary premise. A brazen attempt to revive the saint’s life as a literary genre in an age of unbelief, Beha’s novel also dramatizes the enigma of Christian humility when viewed from a secular perspective. After the experience of being “taken over” by the Holy Spirit during mass at a small church, Sophie Wilder renounces her past enthusiasms and devotes herself to the care of her dying father-in-law. She is gennathei anothen—”not ‘born again,’ exactly, but ‘born from above. '” What happens to her as a consequence is so foreign to postmodern sensibility that an alternative ending must be written. The result is a two-sided novel of unforgettable insight into the religious life. It may be just that “religious struggles…left as religious struggles, not absorbed into other ways of thinking about the world” are the only ones I enjoy. . . . What she believes may make no sense to me, but her actions do, because they predictably follow from her beliefs—and I never have to walk through any attempts at nonmystical moral logicking with her that might rankle or irritate. Beha, Christopher, Myers, D. G.
Although I’m sorry you didn’t enjoy this as much as I did–because enjoyment is one reason we read–I can appreciate everything you say, and it certainly sounds like you appreciated what the novel is doing, even if it didn’t engage you. I’ll admit that I have a bias in wanting more novels to take faith seriously, so I was inclined to like this because it’s a rare thing these days. For me, Sophie’s religious struggles rang true to a certain kind of religiosity I’ve seen among lots of smart people in their 20s and even experienced myself to an extent. There’s a lot of separating yourself out and setting clear rules all in the name of finding a perfect way (perhaps toward sainthood). John Ames from Gilead, on the other hand, has gotten past the need to do that, and it does make him more likable. The inability to describe a religious experience in words also rings true to me–it reminds me of the rich apophatic tradition in which God cannot be described directly because God is beyond language. That could be why I didn’t feel the conversion experience was flat or unconvincing. (I honestly don’t remember it well enough now to say, but too much explaining of the feeling might have put me off.) Maybe the contrast between Eliot and Beha is a contrast between the cerebral and the mystical approach to faith. The cerebral approach might seem cold to some and the mystical insubstantial. I find both to be rich and fascinating.